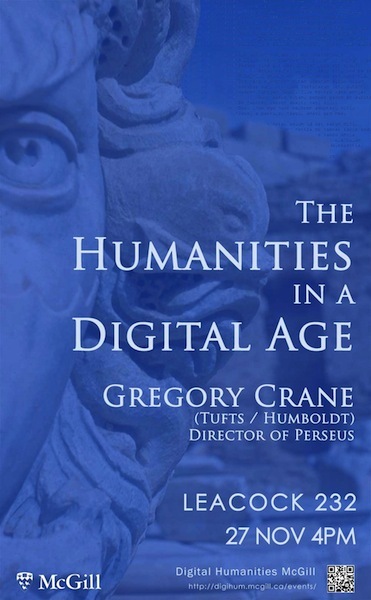 We now live in a pervasively digital world and Humanists have an opportunity to rethink our goals. On the one hand, we can now develop research projects that are broader and deeper in scope than was feasible in print culture. First, we can trace ideas across dozens of languages and thousands of years. Second, the explosion of high-resolution digital representations of source texts, objects, and archaeological data sets has, in some quarters, transformed the traditional (and out of fashion) task of editing. At the same time, the shift to a digital world does not simply allow professors to produce more specialist publications. Rather the explosion in source materials available to a global net public requires advanced researchers and library professionals to draw upon student researchers and citizen scholars as essential collaborators. One possible outcome is a new, decentralized and cosmopolitan republic of letters supporting a global dialogue of civilizations. No particular outcomes are guaranteed and our actions and decisions as Humanists in the present can have far-reaching consequences. 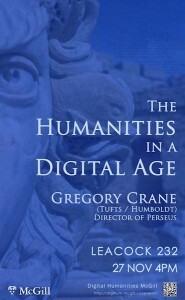 Gregory Crane is Professor of Classics and Adjunct Professor of Computer Science, Winnick Family Chair of Technology and Entrepreneurship at Tufts University. He is also Editor in Chief of the Perseus Project. He has been elected a Humboldt Professor in Digital Humanities at the University of Leipzig and hopes to establish the first transatlantic laboratory in the Digital Humanities.